The Kafka Music application demonstrates how to build a simple music charts application that continuously computes, in real-time, the latest charts such as Top 5 songs per music genre. It exposes its latest processing results – the latest charts – via Kafka’s Interactive Queries feature and a REST API. The application’s input data is in Avro format and comes from two sources: a stream of play events (think: “song X was played”) and a stream of song metadata (“song X was written by artist Y”); see inspecting the input data in the Appendix for how the input data looks like. This tutorial uses Docker Compose. You must install Docker and Docker Compose. The Confluent Docker images require Docker version 1.11 or greater. 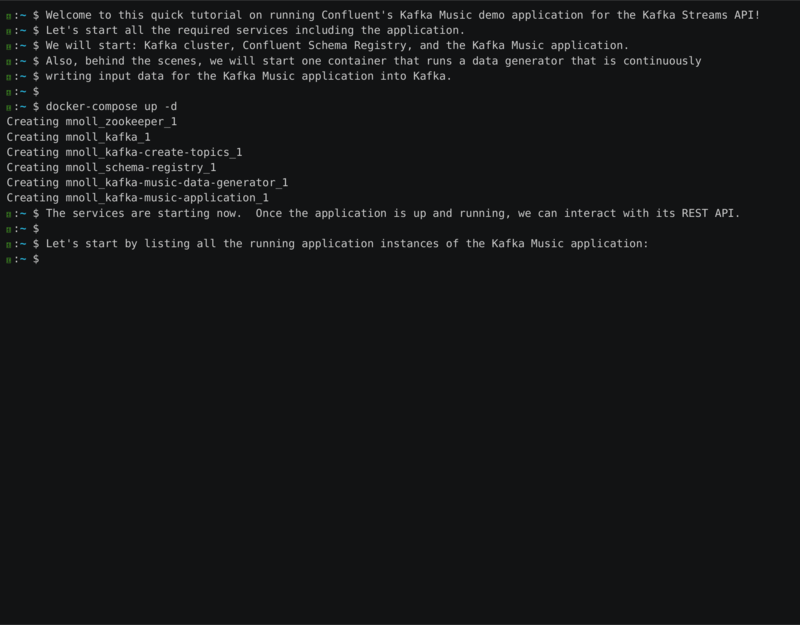 Now we can launch the Kafka Music demo application including the services it depends on such as Kafka. After a few seconds the application and the services are up and running. One of the started containers is continuously generating input data for the application by writing into its input topics. This allows us to look at live, real-time data when playing around with the Kafka Music application. Now we can use our web browser or a CLI tool such as curl to interactively query the latest processing results of the Kafka Music application by accessing its REST API. The REST API exposed by the Kafka Music application supports further operations. See the top-level instructions in its source code for details. We hope you enjoyed this tutorial! Of course you can also modify the tutorial’s docker-compose.yml for repeatable deployments. Note that you must follow the full instructions of each demo application (see its respective source code at https://github.com/confluentinc/examples). These instructions include, for example, the creation of the application’s input and output topics. Also, each demo application supports CLI arguments. Typically, the first CLI argument is the bootstrap.servers parameter and the second argument, if any, is the schema.registry.url setting. The ZooKeeper endpoint is not required by Kafka Streams applications, but you need it to e.g. manually create new Kafka topics or to list available Kafka topics. You can create topics manually with the kafka-topics CLI tool, which is available on the kafka container. You can list all available topics with the kafka-topics CLI tool, which is available on the kafka container. Additional topic information is displayed by running --describe instead of -list.